In 1959, when Soviet Premier Nikita Khrushchev visited the United States for nearly two weeks, the trip turned into one of the grandest, most outlandish and surreal spectacles of the Cold War. It launched the term "media frenzy," and turned into a traveling cyclone of international intrigue, media insanity, fierce disputes, loud jokes, angry speeches, belligerence and comedy, Hollywood stars and Iowa farmers. 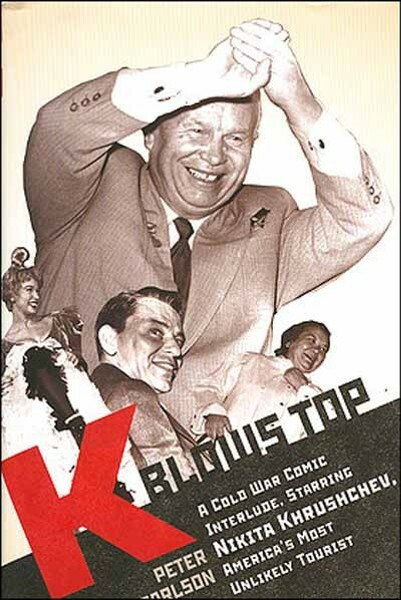 Author Peter Carlson captures the mad, nearly delirious atmosphere of both the Cold War and Khrushchev's visit in high-comedic style in K Blows Top (the title repeats a New York Daily News headline published after the Soviet premier was told that, for security reasons, he couldn't go to Disneyland). By the time Khrushchev came here, he was seen in the USSR as a relief after decades of Stalinist terror, a reformer from peasant stock who joked around and offered folksy advice to his comrades. In the United States, however, with both our government and the Soviets in full Cold War propaganda mode, Americans viewed Khrushchev as just shy of Satan, a scary, scowling man who personified communist evil, who'd told capitalists "We will bury you," and had sent tanks to crush the Hungarian uprising of 1956. When his planned visit to America was announced, public reaction was mixed at best. Carlson deadpans his way through a story that's tailor-made for repeating and wisecracking asides, with solid reporting that tilts toward the hilarious. He captures the American mood of the time -- a confident, more naïve country that distrusted K, but wanted to impress him just the same, as he toured the United States with his official "guide," UN Ambassador Henry Cabot Lodge. Federal officials, particularly the Secret Service, were scared to death by the high number of death threats to Khrushchev, and at first tried to keep him from large crowds. K went along for awhile but after a few days of meeting no one but dignitaries, politicians and businessmen, he rebelled. At one point he escaped his own security men in a hotel and roamed around, smiling at people and shaking hands. Both the American and Soviet security teams flew into a state of near-panic until someone noticed the premier leaning over a balcony, waving at the crowds below him. Most people in those crowds were friendly to K (at least after the first day, when thousands of wary Americans lined his motorcade's route, simply staring at him), but some people weren't such gracious hosts. In New York and Washington, reporters and businessmen dogged K about the lack of freedom in the Soviet Union, and he responded with a mixture of boasts about Soviet accomplishments and pure red-faced, fist-shaking anger. His outbursts, which were matched by his general friendliness, even silliness, confused those around him. Was he really as mad as he seemed? He was. By the time he reached Los Angeles, halfway through his trip, Khrushchev had had enough of being poked at by critics. And then the Secret Service told him he couldn't go to Disneyland, and he blew his stack. At a Hollywood luncheon where he delighted and grossed out a who's-who of movie stardom including Liz Taylor, Marilyn Monroe, Bob Hope and Frank Sinatra, he raged against the new No-Disneyland rule. After watching a live dance number from the movie Can-Can featuring Shirley MacLaine (he smiled for MacLaine but declared the dance "pornographic"), he attended a dinner at which L.A. mayor Norris Poulson, a conservative Republican, needled and embarrassed him. In K's reply, he turned progressively redder and his voice rose higher and higher as he reminded everyone that he could blow up the world with nuclear missiles, and made it clear that if he had to take any more crap, he'd go home. At that point, President Eisenhower intervened behind the scenes and told officials and security staff to lighten up; K was, after all, a guest -- and considering that whole nuclear war thing, a particularly important one. After L.A., Khrushchev was allowed to shake hands with crowds, and his mood improved. He caused a near-riot in a large San Francisco department store, mugged relentlessly for the press, and ate hot dogs. He kissed children, mocked Richard Nixon -- always a plus in this writer's view -- and toured a large Iowa farm at which the media circus had grown so large, the owner began throwing cornstalks at reporters who were trampling his crops. At the end of his trip, K met with Eisenhower at Camp David, which he viewed as a pretty measly vacation spot, and went home to acclaim from his nation's cowed press. Not long after the trip, an American U2 spy plane was shot down over Russia, which was followed by a Khrushchev performance at the United Nations that became a Cold War icon, as he tried to drown out criticism of the USSR by banging his shoe on a table. He was a complex, comical, scary man, and Carlson does an excellent job of capturing the craziness surrounding his historic trip to America.